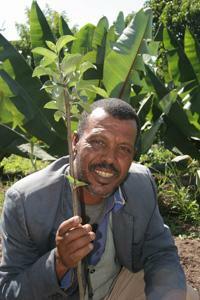 The Ammado article Apples in Ethiopia chronicles the 2006 efforts of Self Help Africa to import 3,800 apple rootstocks from Spain to be grafted in the Oromia region of Ethiopia. These should start bearing this year and it will be interesting to see the results. The more I poke around the more I find apples growing all over Africa. 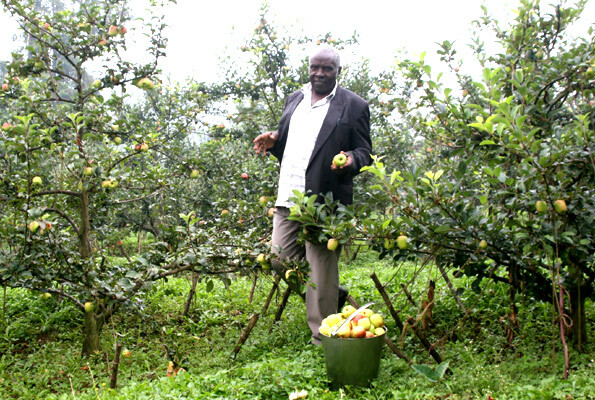 Saw this great report on Growing Apples in Tropical Mountain Conditions in Northern Ethiopia as chronicled in Cambridge Journals. An excellent scholarly work that answers a lot of questions, but also poses many. I can think of some variables that they did not consider, such as using a more vigorous rootstock than the M9 they used, and also the narrow time frame given the project. Fuji takes about 5 years to stablize and adapt to a warm climate, and the blossom period will become more compact in time. They also focused on apples currently marketed with high demand, and had a very narrow selection for trials. I would do the same experiment with at least 50 varities that have been tested in a warm climate (gee, where would they find those?…) Good color was mentioned, but Fuji has lousy color even in a cold climate. They used Dormex to encourage bud burst, something that cannot be used in many remote places of Africa (its nasty stuff too). All in all a worthy effort but I think much more work needs to be done, and I think we can help. After last week’s cold rain and mountain snow, the skies have cleared up and today was a glorious Southern California winter day with blue skies, snow-capped mountains, trees full of ripe oranges, and 80 degree weather. I had to find some excuse to go out into the back yard, and found it in the form of the potted “sleeping eye” above which is a bud from Anna apple grated onto a seedling rootstock. 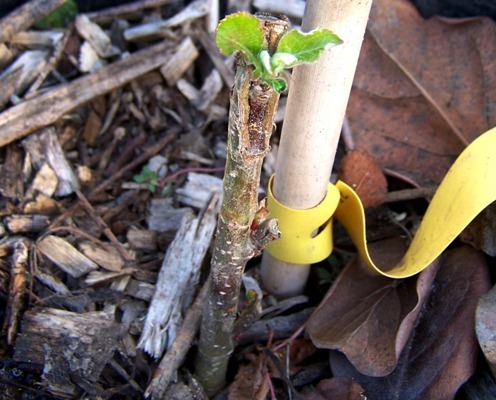 Once again, a bud graft took and is starting to push growth from the bud (to see me doing one of these grafts, click on http://www.youtube.com/watch?v=islhXlUk9N8 ) I’m still amazed when seeing a graft starting to take, as I don’t fully understand how it could be, and neither can the botanists who study these types of things. All I can say is that its the finger of God, where you can take a slice of one plant, fit it imperfectly onto a wound on another plant in unsterile conditions, and it take so readily and knit into one single plant, all the while maintaining the seperate attributes of the two plants. Without this process we would starve, as most wild apples are inedible for eating fresh and the only way to perpetuate good ones is by grafting. Speaking of which the first of my rootstocks arrive tomorrow, and so once again I’ll disappear down into the basement every evening and weekend for a month, my wife seeing me just long enough to eat dinner. Soon hundreds of tiny benchgrafts will also be amazing novice growers with the miracle of grafts starting to push. How you can see something like this and still be an athiest, I don’t know. A busy day today finishing two last videos before the mayhem of spring grafting commences. This completes our grafting library and supplies the grafting knowledge necessary for most situations you may encounter. Here’s one on Whip & Tongue grafting; let me know if you like the music in the background of if it’s distracting. I added a Cleft Grafting video to our YouTube channel, kuffelcreek. Today is February 1st, which means it’s time to pick Lady Williams, our latest-ripening apple. Once again they missed all the sunburn and pests and turned out a flawless crop of apples that look like Christmas ornaments on the mostly-bare tree. 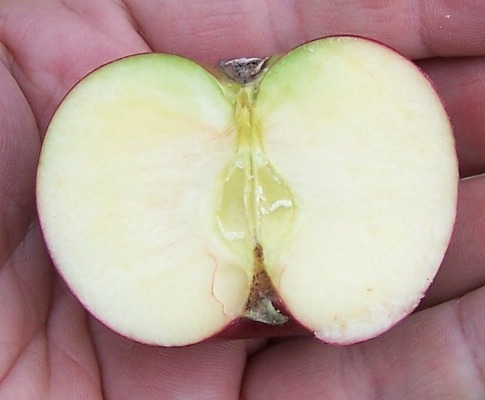 Lady Williams was developed in Australia in 1935, a Granny Smith offspring that is also a parent of Pink Lady. 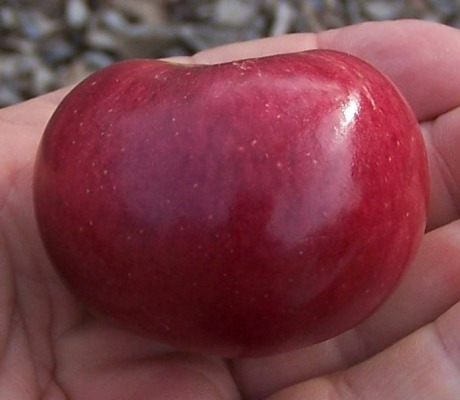 A pinkish-red apple with a distinctive horizontal white stripe on one side that ripens very late and needs a long hot season. In our climate it ripens around the beginning of February, right after Dorsett Golden and Anna blossom. Will keep until the first summer apples ripen and improves in storage. It is quite tart until fully ripe, when it developed a nice sweet/tart balance. So far it has out-produced its offspring Cripp’s Pink (aka Pink Lady) and has been tested very good for Southern California and added to our favorites list. The skin is tough and the flesh a tad dry, but still much, much better than anything we’re finding in the store right now.